The integrity building of Macao started at the year of 1992 witnessed the entry into force of Macao’s first anti-corruption law and its establishment of an agency dedicated to graft fighting, this year is running to 20 years. 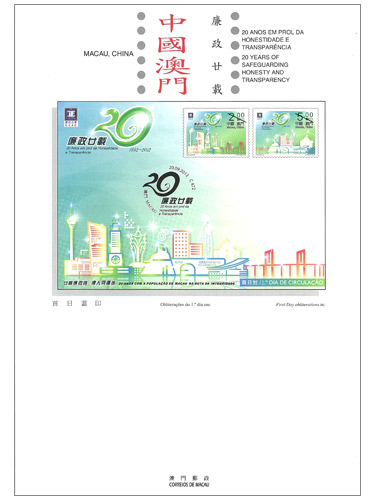 To commemorate the efforts made by the Government of Macao SAR, Macao Post will issue the stamp theme “20 Years of Safeguarding Honesty and Transparency” on 20th September, 2012. This is the same theme after the stamp “10 Years of Safeguarding Honesty and Transparency” issued in 2002. This issue includes a set of two stamps. 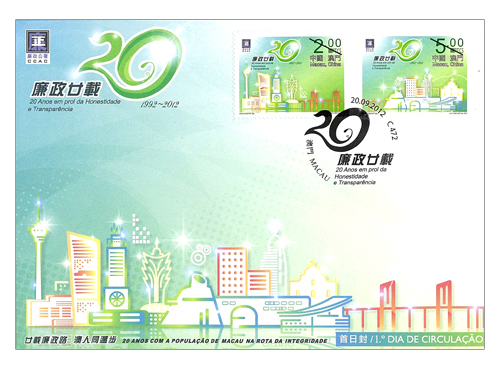 The design of this stamp issue and the text of the information brochure are responsible by Commission Against Corruption of the Macao Special Administrative Region. The stamp designer of CCAC is Mr. Kuan Chon Kit. This is the ninth issue in 2012. 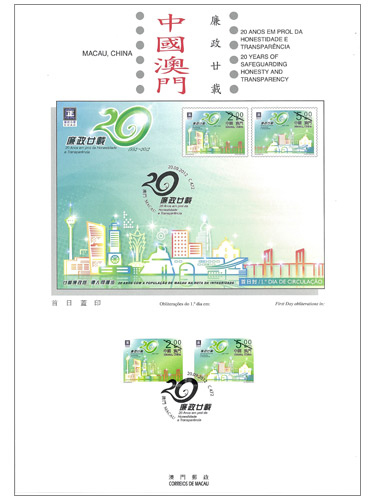 The previous issued stamps are “Lunar Year of the Dragon” on 05/01/2012, “A New Era of Smoke-free Macao” on 31/01/2012, “I Ching, Pa Kua VIII” on 01/03/2012, “70th Anniversary of Tai Fung Bank” on 28/03/2012, “Fishing Harbour in the Past” on 18/05/2012, “80th Anniversary of the Founding of Hou Kong Middle School” on 10/06/2012, “120th Anniversary of Tung Sin Tong Charitable Society” on 08/08/2012 and “Legends and Myths X – The Cowherd and the Weaving Maid” on 23/08/2012. 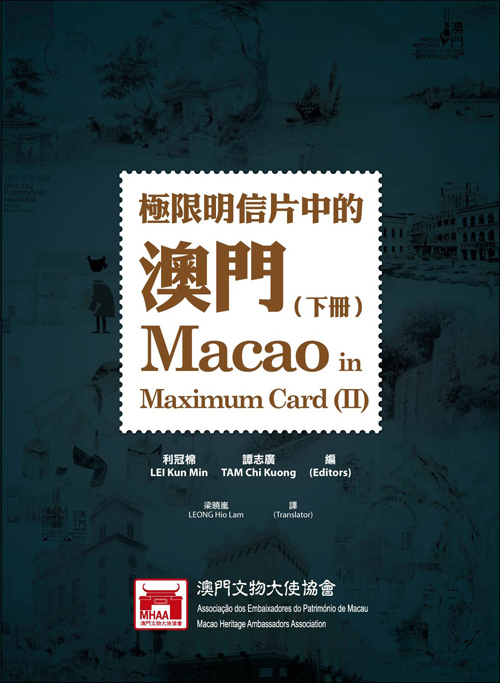 The publication "Macao in Maximum Card II", an edition in Chinese and English, published by Macao Heritage Ambassadors Association will be available for sale at Macao Post from 20 September 2012. The first volume of this publication was released last year. Same as the first volume, this volume reveals the past and present of Macao, through over two hundred precious maximum cards, including modern architecture, sea-crossing bridges, bronze statues and sculptures, Macau Grand Prix, peoples’s livelihood and paintings of Macao through the eyes of painters, etc. The pictures are accompanied with descriptions, the content is rich and interesting. "Macao Maximum Card II" is priced at MOP 128.00. 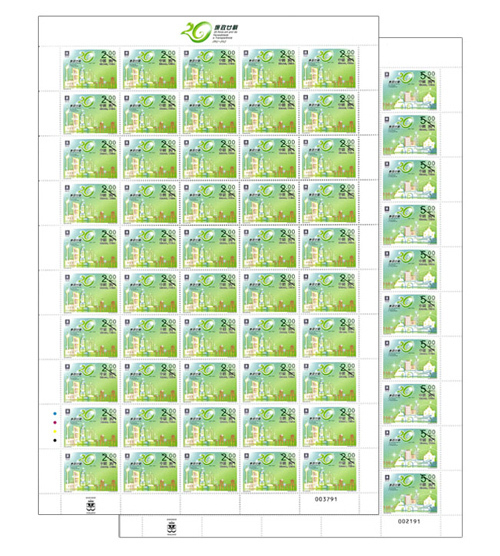 It will be available for sale at the Philatelic Shop of Macao Post Headquarters.